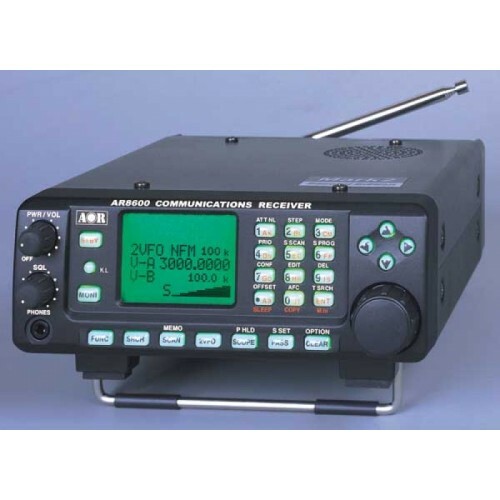 GENERAL Type:HF/VHF/UHF receiver/scanner Frequency range:0.1-3000 MHz (Cellular blocked in the US) Tuning steps:50 Hz to 100 KHz Mode:AM/NAM/WAM/SFM/NFM/WFM/USB/LSB/CW Channels/memory management:1000 regular in 20 banks. 37 ch/s. Flash-ROM Power supply:10.8-16 VDC external or 9.6 VDC from optional NiCd battery pack Current drain/power consumption:70-400 mA Antenna impedance/connector:50 ohms / BNC Dimensions (W*H*D):155*57*195 mm (6.1*2.2*7.7") Weight:2 Kg (4.4 lbs) Other features:RS232C port. Plug-in ferrite bar for MW reception. AFC. Spectrum scope. 10.7 MHz IF output.